What follows is a roundup of updates, analysis, and media reaction from across the country on the Roger Clemens-Brian McNamee saga. And Roger was in no way an abuser of steroids. He never took them through our tough winter workouts. And he never took them in spring training, when the days are longest. He took them in late July, August, and never for more than four to six weeks max … it wasn’t that frequent. “What does (Clemens) do, he calls him back with his lawyer in the room and a tape recorder going,” McNamee attorney Richard Emery told the Daily News last night. “He wants to play that game, he’s going to get buried. I have no compunction about putting him in jail. Clemens must have thought this conversation, which came across looking like a clumsy set-up, would somehow persuade people that he is the one telling the truth and that McNamee is the one lying here. If anything, though, this recording, as odd and rambling as it was, seemed to help McNamee more, because as needy as he sounded, he never changed his story. There was all that time, 17 minutes, for him to admit to Clemens that he lied, that he did exactly what Clemens on “60 Minutes” said he did, which was tell this huge and terrible lie about Roger Clemens, give Clemens up to the government, to save himself. What I heard was the voice of a man who was given the keys to the kind of exclusive palace available only to the very rich and the very famous, who was actually allowed to call Roger Clemens “friend,” and has now had that all taken away from him. Maybe it’s the voice of a man with a sick child and a ruined career, too, who at the very least dabbled in some highly illicit behavior and who now listens daily to his former friend lash out at him with venom in his voice and menace in his eyes. Think of that as you listen to the pathetic sound bytes of a broken man, talking to the star he once idolized, who also happened to be one of the most intimidating athletes who ever walked onto a playing field. Think about how daunting it was to be Barry Bonds or Mike Piazza or Derek Jeter staring down Clemens. Now think of what it’s like to be Brian McNamee. Here was the great, brush-cut Rocket character, filled with denials about the accusations by Brian McNamee, his former personal trainer, and chesty indignation bordering on intimidation. There was his wisecracking lawyer, Rusty Hardin, who sounded astonishingly like Jerry Jones, and passed Clemens a note saying, “Lighten up,” as if they were in junior high math. There was the 17-minute audiotape of last Friday’s Clemens-McNamee phone call, which proved little, offered nonsense worthy of the Marx Brothers and made McNamee sound sympathetically tragic. And there were the e-mail messages from fans that inexcusably popped up on ESPN2, one of which read: “Roger Clemens is a criminal and a cheat. 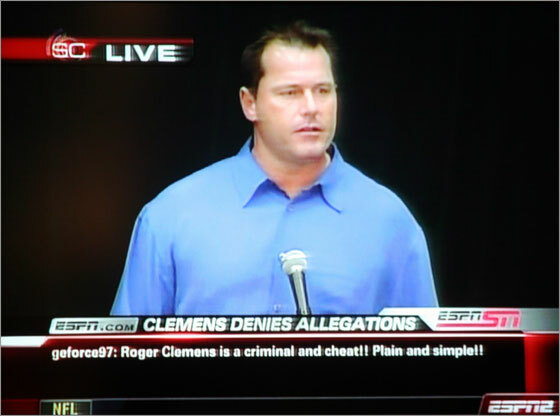 Plain and simple.” So much for the presumption of innocence that Clemens is seeking. As the phone call played and little information was revealed, the audience was left mostly listening to a friendship fracturing in real time. With no true bombshell for the news media and fans to dissect, the lasting legacy of the phone call became not what was said, but what was not. “I didn’t do this, Mac,” Clemens told McNamee. It even reminds us of the statement Red Sox general manager Dan Duquette made in 1996 when Duquette failed to re-sign Clemens and let him go to Toronto. Duquette famously said he wished Clemens well in the “twilight of his career.” Just in case anyone has forgotten, the lawsuit reminds us that Clemens won the Cy Young and the pitching triple crown in his first year with the Blue Jays. When he won only seven games for the Astros in 2006, the suit makes sure we know it was because of “low run support.” It may be the first time in the history of American jurisprudence that “low run support” has made it into a legal document. Why blow off ESPN? Two people familiar with the change in plans said McNamee told the network he was advised not to go on TV by the feds with whom he has cooperated. Based on his nervous, scattered demeanor on that call with Clemens, McNamee probably made the right decision, and he might yet have trouble matching wits with Clemens before Congress next week. That doesn’t mean McNamee is lying. But he now knows he is facing a guy who still throws heat. 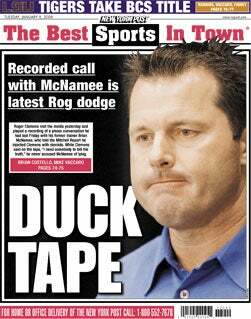 Was Brian McNamee asking Roger Clemens for money? That’s certainly how it sounded. How do you like your star witness now, George Mitchell? If Clemens had made an offer, would McNamee have changed his story? He sounded desperate enough to do or say just about anything, telling Clemens he has no money, no job and a very sick son.